Setting new safety and efficiency standards, MacGregor is poised to introduce the world’s first autonomous discharging cranes, equipped with self-learning capabilities. Approaching their final stages of construction, MacGregor will soon be able to test and showcase unique self-learning cranes on board commercial vessels. 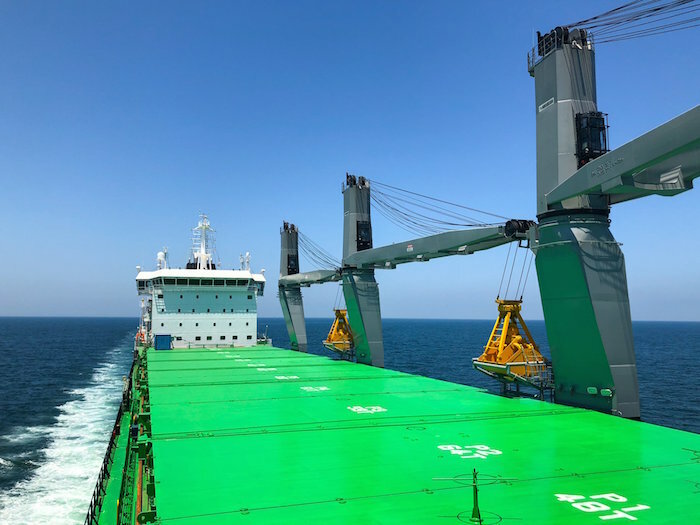 Developed as part of a joint project between MacGregor and ESL Shipping Oy, part of Aspo Plc, the world’s first autonomous discharging bulk cranes will be fitted on ESL’s two new liquefied natural gas (LNG)-powered Handysize bulk carriers, Viikki and Haaga. ESL knows MacGregor cranes very well and relies on their proven technology on a number of vessels. 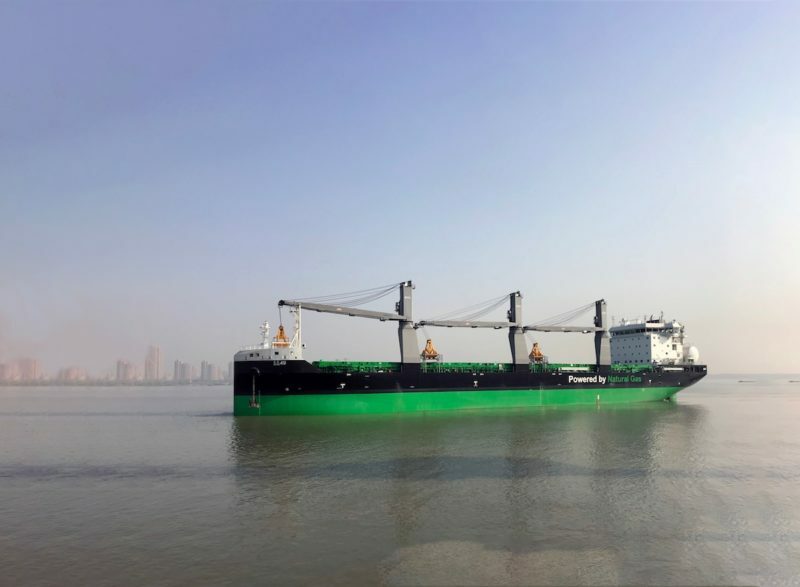 Its latest 25,532dwt bulkers are under construction at Jinling Shipyard in Nanjing, China and are on schedule for delivery later in the year. To serve each of their three holds, they feature three specially-developed MacGregor electro-hydraulic cranes, which have a safe working load of 30 tonnes with a grab and an outreach of 30m. Like the majority of its vessels, once delivered the 160m bulkers will serve the Baltic region. “Working with ESL on this development project has been a fantastic experience and a great collaboration opportunity,” says Ilpo Heikkilä, Vice President, Engineering and R&D, Cargo Handling at MacGregor. “By combining the expertise of a forward- thinking shipowner and operator with our knowledge in intelligent cargo handling, we are able to develop safer and more efficient solutions for unloading bulk cargoes and therefore reduce unnecessary waste in the value chain. A number of features maximize efficiency. Each crane pre-calculates suggested routes using MacGregor’s command input shaping technology to optimize paths, ensure pendulum-free motion and minimize the total discharging time. Using advanced sensor technology, material distribution in the hold can be analysed to ensure optimal unloading. The crane’s topographic software module creates a map above each cargo hold to find optimal lifting points, further adding to the cranes’ efficiency. The system also calculates which shore side hopper to use, depending on the hopper’s capacity. The grab is controlled by an intelligent, self-learning algorithm that automatically adjusts to ensure that the bucket is filled to an optimum level and not overloaded. The auto-grip module readjusts lifting parameters when material properties change, automatically adjusting to switches between cargoes. The communication module between the cranes is the backbone of the system, sharing information such as current and upcoming positions and other important parameters. It essentially mimics a crane driver’s desk and can be located on the ship’s bridge or anywhere the system operator has a view of the crane position and the topographic cargo map. In addition to supervising and monitoring the system in operation, it also remotely controls each crane via dual monitors. Safety advances are a key benefit of autonomous discharging bulk cranes. Speed and crane movement are continuously monitored to ensure cargo is moved without causing pendulation. However, if this does occur, it is automatically corrected by the cranes’ anti- pendulation system. Numerous sensors also compensate for a vessel’s change in list and trim during operations, so a stable discharge point is continuously maintained. additional crane functions can be included separately, depending on the level of automation.